Quality oldskool prod! Hope, it's not really your last one for A500, but good luck with your future projects. Beautiful! I always liked your attention to detail. Looking forward to your next releases. Very nice and pure oldskool! Please make more such A500 releases! Sweet oldskool & i loved the audio. Ha! Just the other day I was thinking when the last Rebels/Neural release came out... and right there is a brand new prod! amazing tune and big logo. Good stuff! And waiting for Hitch's new platforms. This is some really nice work you have done here, feels like the early 90s all over again :). It's 100% authentic 1990 all right :) So hey ho, no shiny new OCS effects for me to savor (waah sniffle), but thumb goes up (creeeak) 30 nygrader above the horizon for what Bonefish said. nice one. solid, but small. Quality old skool flavour. Always a pleasure watching Hitchikr prods! Look forward to more cool releases in future. On real HW (Amiga 500 with 50Hz CRT TV connected) I get severe flashing on the big scrolling logo. Looks fine in WinUAE. Could perhaps be some artifact caused by interlaced mode and scrolling when having a "real" odd/even display. Really nice! Hmm, do I recognize the neural logo from Puzzled? wooooohoooohoooo what a nice and unexpected release!!! It was ok, very retro indeed. Shame about the re-use of old gfx, were they all credited or did I miss it? But I guess decent pixel artists are hard to come by these days, I certainly couldn't do it. I liked the graphics and the effect on the logo, the music is a bit rough for the standard effects. Not bad but way too old-fashioned for me, feels like "take some routines from 2 decades ago I want to use somewhere and slap them together". The logo effect at the beginning is pretty nice though and I also like the greetings part. Music rules, effects and graphics are nice. 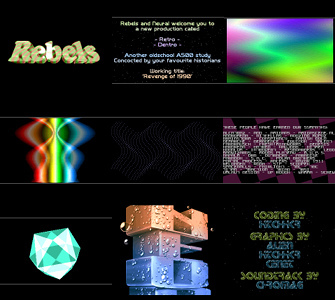 Cool music, cool credit fonts, cool Rebels and Neural logos. It would have done well in Revision compos. Great oldschool demo. Waiting for your new endeavours! Overall it's a nice demo but the flow went slower and not as interesting in the end. No offence meant guys, just my opinion. StingRay complaining about the effects being too retro? The world ends! :-) Thumb for the music and gfx content. Effects are not my cup of milk, it's hard to get excited seeing another glenz or plasma. And I find the fonts in credits part really ugly :( But the opening logo effect is awesome! retro effects but retro mastered effects ! I would not expect less from this team. exactly what others said, gets nice oldschool feeling when watching it. Thx! oldschool looking dentro by oldschool looking people :) Rulez! Awesome prod, top graphics, really like the neural logo coloring effect and generally the good sync with that massive soundtrack. Anyway, the whole demo looks really super clean & smooth (watched it on a 030). Good demo, great music. The big rebel logo seems to come in different colors. Watched the demo first on my A600 and there it has a color between green and blue. Later when i watched the demo in WinUAE, it was purple. :) And by the way, the demo seems to work without problems in OCS, because in one of the readme`s was written it needs ECS. A solid oldskool amiga production with great music. What 4pLaY said. It feels good the 90's ! Good work. Sick soundtrack, Chromag. First, i thought where it would go but it totally got me later. Neural Logo is ace, too. Next time bring some 2016 to the Amiga! props to chromag for letting this old samples sound again! Great, great track but not soo interesting visuals. Nothing's wrong with the visuals really...I've just seen those effects too many times already over the years. Still a thumb for a solid production. I like the coloring effect on the big logo. Simple but looks really good. Oldschool! retro fx with style. Love that track. The biggest drawback, from my point, is that some gfx were taken from the other prods and reused. But, ha, almost noone seems to see that. Might be cause the prod is well coded or jus because 't was coded by hitchhikr. "These people have earned our... sympathy"... Is not a word "sympathy" a french-english linguistic "false friend"? Overall - really nicht schlecht! The scrolling logo flickers like crazy, is it some kind of "colour interlace" effect? Otherwise, nice stuff. good tune, rest of it is well executed but a bit old school for my tastes. Sweet color tones and cool music. Also nice Neural logo! page created in 0.020733 seconds with 15 queries.